Wonderfully displayed in a handsome basket, our Colossal Fruit Basket contains the most luscious domestic and tropical fruits available. Fruits may include apples, oranges, grapes, kiwi, pears, nectarines, bananas, pineapple, and coconut as available. A great gift for any occasion. Exact basket and fruit selection may vary by season and delivery location. Colossal Fruit Basket is a hand delivered gift. These gifts are delivered by one of our local design centers located throughout the United States and Canada. Same day delivery is available for most gifts when ordered before the cutoff time. The cutoff time for Colossal Fruit Basket is 1 PM in the recipient's time zone. The customer service was awesome and being able to customerize the fruit basket the way I needed it to be. That was the main attraction for me. I would use your services in the future. customer service was outstanding I will not deal with another company every thing was quality. I sent this to my 20 year old son for his birthday and he said he loved it. He is trying to eat healthy and it was a nice alternative to cookies etc. He stated that all the fruit was very fresh. He loved that they even put coconuts in the basket!! My daughter received a Colossal Fruit Basket and said that it looked so beautiful she thought they were wax fruit! 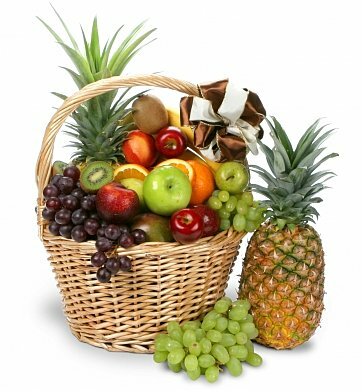 We ordered a Colossal Fruit Basket for Father's Day, but GiftTree was unable to deliver due to unavailable vendors in their area. They quickly contacted us, let us pick a substitution, and refunded the cash difference. Very nice to deal with. My father said the basket was great and he enjoyed everything in it. Just got an e-mail from the family that received the basket saying it was absolutlely beautiful. I am more than pleased. Thank you and I will recommend you to all my friends. The recipient was very pleased with the basket. They were already enjoying the fruit and said it was good. It was delivered exactly as I requested. As a 1st time customer, I was well satisfied. The fruit was fresh and delicious. A red rose added a beautiful touch to the lovely presentation. My relatives loved the fruit basket. My greatnephew, Zack, loved the kiwi. I received an email thank you from the family. My sister-in-law said the fruit was so fresh and juicy. Everyone found some fruit to enjoy. The person I sent this to was extremely happy with the size, arrangement and the variety of fresh fruit. My friends said it was so beautiful they didn't want to open it! When they opened it they could not believe how much fruit was in it and how good it was. Thank you for making my gift giving easy. I would definitely use you again!!! This was ordered in lieu of flowers for a funeral many states away.The espouse was great, said the fruit basket was absolutely great,even had a coconut. Sent to a dear friend who is in a nursing home. Father Joe said it was so beautiful and so much fruit he was able to share it with many people who also live in the home. Thank you for helping me to brighting up someone so special to us and him being able to do the same for others. Sent this fruit basket to my daughter for her birthday. Because of the extremely cold weather in the northeast I was concerned that the basket would be left on her doorstep and freeze. Not to worry, she received a call from the delivery service making sure someone was home to receive the package. Beautiful high quality fruit...Thanks! This was my first time sending a fruit basket and I had no problems. I sent this fruit basket as a sympathy gift to my boyfriend's family after their grandmother passed away. This fruit basket was well received. They said it was large and they snacked on it the whole week until it was done. The basket is also very nice and they plan on using it. I ordered 2 days in advance for 2pm and delivery was right on time. I'll definitely send one of these again!! Although I didn't see the basket firsthand, (I live miles away), I understand from the recipient that it was magnificent! He loved everything about it.... especially the pineapple! My mother was so happy with the presentation and taste of her fruit and other items. Proud to give this Basket! This was a gift to family and I know they would tell me the truth. They loved it. The fruit was fresh and the presentation great. Good to know when you send something you can depend on it be a good quality. Delicious fruit and lovely presentation! I would definitely recommend this gift. I sent it to my son when he came home from the hospital and he is a huge fruit lover. He appreciated the gift. Fresh and good selection of fruits. The recipient of the basket called me to say that the the fruit basket was very good. This item which was sent as a gift arrived on time as described with pineapple, coconut, grapes, and much more. I purchased this basket for a co-worker and his family whose father recently passed away. They live in a small town in Mississippi and I couldn't find any body to deliver to their house. When I found this company I was happy but didn't know if the basket would arrive on time and what it would look like. Well, my co-worker called the next day and said the basket arrived that same day I had ordered and it was absolutely beautiful! He said the family appreciated it so much and they had fruit in there that they had never even seen - it was delicious!!! I'm so happy I found this company and they did such a wonderful job putting together this beautiful and tasty basket. Thank you so much! I know where I will be shopping again in the future! Make someone feel so good! I sent this to my daughter-in-law who just had surgery. When she got this she was so excited. She loves fruit. She said this was filled with all kinds of goodies. She gets lots of flowers and she has alergies so this was wonderful. The whole family is enjoying Grandma's gift. I like the online ordering experience. It's easy and reliable. I was surprised that it allowed me to select the same day delivery. I was suspecting it would not be possible, I believe it was delivered the day after the one I had selected. I was glad I placed the order two days early, In the picture, it did not show any coconut, but the person who received my gift told me a coconut was in the basket. We sent this gift to a friend in Florida and she loved it!!! We are very happy with the fast delivery service. We highly recommend! I have ordered this basket several times and I've never actually been able to see it in person. However the last time I sent it I received a text message and a picture - the quote was the fruit basket was a huge hit and the picture showed the basket was huge and full of fruit. This was an anniversary gift which was very much appreciated. Receiver of same commented on the variety of items and the presentation. Our employee who received the basket loved it and said it was full of everything. The shipment was prompt as you presented it. All in All we are pleased to do business with you. Thank you. I just want to thank you for doing such a great job on the basket sent to a co-worker who was recuperating from surgery. She loved the basket and so did her family. She thoroughly enjoyed it. The basket looked amazing! Also, great customer service! recommended your company to my friends. Gift for a sick uncle! I recently sent this basket to a 90 year old sick uncle in a nusring home (Cleveland, Ohio). The family called immediately to tell me how beautiful and plentiful it was. There was so much to share, which my Italian uncle was so pleased about......Italians LOVE to share their food. Thank you GiftTree for making my uncle happy in receiving a basket that he could so enjoy! Purchased online from a photo. Basket delivered as pictured in advertisement. I'm very satified. I sent the Colossal Fruit Basket in lieu of sympathy flowers. The basket was greatly appreciated and enjoyed. I sent this to my father for his birthday and he said the delivery man asked if he could bring the basket in because it was heavy, and wished my dad a very happy birthday. When my dad opened the basket and looked at all that was in it he was amazed at the amount of goodies and fruit. That explained why the delivery man brought it in. My father said it was incredible in appearance and festive and everything was fresh and delicious! I definitely will order from Gift Tree again! Beautiful presentation and fruit was very fresh. Delivered on time. fruit was excellent--made into large fruit salad. This was the perfect gift to send to my friends family after the loss of their mother. They live in a cold climate, and the fruit basket filled with beautiful fruit was really appreciated by the family. They said the basket was abundant with fresh beautiful fruit. I will definitely use them again in the future ! The recipient was very pleased with the Colossal Fruit Basket. My husband and I sent a beautiful Fruit Basket to some dear friends in Florida to "get well." They said, the basket was beautiful; but, the fruit was fresh and so very delicious. There was so much fruit, they shared it with their friends throughout their neighborhood. I would definitely use "Gift Tree" again in the near future. If our friends were very pleased, so then were we! Thank you for allowing the "sender" to share comments. Never ordered here before. The gift arrived on time and the person receiving the gift was happy with it. Fruit was fresh. Thank you for the great product and service. I sent the colossal fruit basket to my mother-in-law for Christmas and she loved it. I have ordered from you many times and have always been pleased with the product and service! Thank you! Of course, I haven't seen the fruit basket, but my sister cannot stop raving about it! She said it was so laden with fruit, the delivery man had to bring it in and set it on the table. She is very happy which makes me happy! Fruit and presentation was exceptional. Because of the location of the delivery they were not able to deliver same day. They made every attempt by email and voicemail to let me know of the delay. I was very grateful. Definitely use them again. Thanks for your service. We live in Russia. We ordered a basket with fruits for our mother, she lives in the USA. She received a basket with fine fruit in time and she was very happy! SENT THIS FRUIT BASKET TO MY SON WHO HAD OPEN HEART SURGERY --- SAID FRUIT WAS FRESH AND BASKET WAS FULL OF GREAT FRUIT---- WAS MUCH APPRICATED BY HE AND HIS WIFE. I sent this to family out of town. It was shipped a day late and all of my shipping was refunbded without me having to make one call... This is how you do business. The basket was well received and better than expected. It was absolutly beautiful! Everything was fresh and nicely presented. I will come back next time. I ordered this at 12:30 and it was received by the recipient by 5 the same day. She was so surprised and the fruit was really fresh, I didn't realize how much fruit it really had. I was a little upset that they called to make sure she was home before they delivered it, but I think all in all it was an excellent service. Great Get Well Soon basket! I like the fact it was whole fruits and not sliced like some others I have used. Looking forward to ordering in the future. The gift was well received, the fruit was beautifully displayed. The size of the fruit basket was larger than expected. Gift was delivered on Saturday instead of Sunday and the card read from the marcles instead of the macke's so she didn't know who it was from. The person who received this basket was delighted. She said it was beautiful and quite full. I heard great feedback from my family with comments of the freshness of the fruit, the variety of fruit was an excellent choice and the gift wrapping was beautiful. And, a hint to do it again. I sent this gift to my nephew who is recovering from knee surgery. He loved it so much that he sent photos via phone to his parents who shared them with me. It was lovely. We all are thrilled with it. I SENT THIS FRUIT BASKET TO MY SISTER ON HER BIRTHDAY. THE WAY SHE RAVED ABOUT THIS COLOSSAL FRUIT BASKET MADE ME FEEL SO GOOD. I AM EXTREMELY PLEASED WITH THE PRODUCT. THE SERVICE AND PROMPT DELIVERY WAS EXCELLENT. I CANNOT GIVE ENOUGH PRAISE FOR THE GREAT SERVICE AND QUALITY OF THE PRODUCT. IT WAS DELIVERED THE SAME DAY I PLACED THE ORDER ONLINE AS STATED. GREAT PRODUCT, GREAT SERVICE. THANK YOU SO MUCH, I AM VERY PLEASED! I RECOMMEND THIS PRODUCT AND SERVICE TO ANYONE WITHOUT HESITATION.